A reshuffle of the BBF league saw the Falcons playing in Southern Conference Division Two in 1998. The Falcons were developing as a club and and as a team. They now had registered game officials – both scorers and umpires. Earl and Dominic were still teamed up as Coach and Manager. 1998 also saw some significant additions to the team: Stuart Boast, a former Hemel Red Sox player, absolute powerhouse at-bat, and fantastic 3rd baseman. Henri Booy another Red Soxer – a strong utility player and an absolute gentleman. Jose Rus a Venezuelan pitcher. These experienced players added a depth to the Falcons. Dominic had been carrying the pitching burden himself – now he had 3 players that could assist him. That season the Falcons racked up 11 wins and only 3 loses. They were coming of age. They got off to a great start beating the Tiptree Rays on the first game. The Falcons also won a tight one run victory over the Richmond Flames. 24th May 1998 saw Southend getting their league revenge and beating the Falcons 35 to 17. However the Falcons put in strong performances against Bracknell away and Tiptree at home. 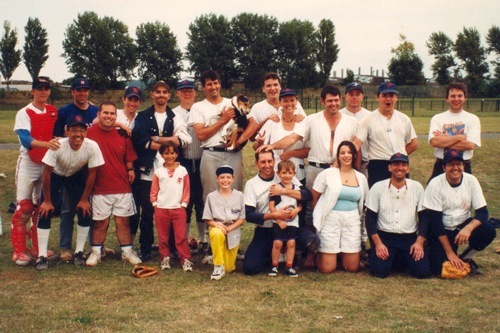 By late July 1998 Southend and the Falcons were the two teams at the top of the table. They played on the 19th July and the Falcons emerged victorious. This meant that they had a chance of winning the league and promotion. Unfortunately the experienced oppositions’ quality showed through. Whilst there was also no shame in losing against such strong opponents as Richmond Flames and Bracknell Dynamite, it did mean the end of any promotion dreams for the Falcons.